Six Degrees of Freedom is a response to looking at the late seascapes of the painter J.M.W. 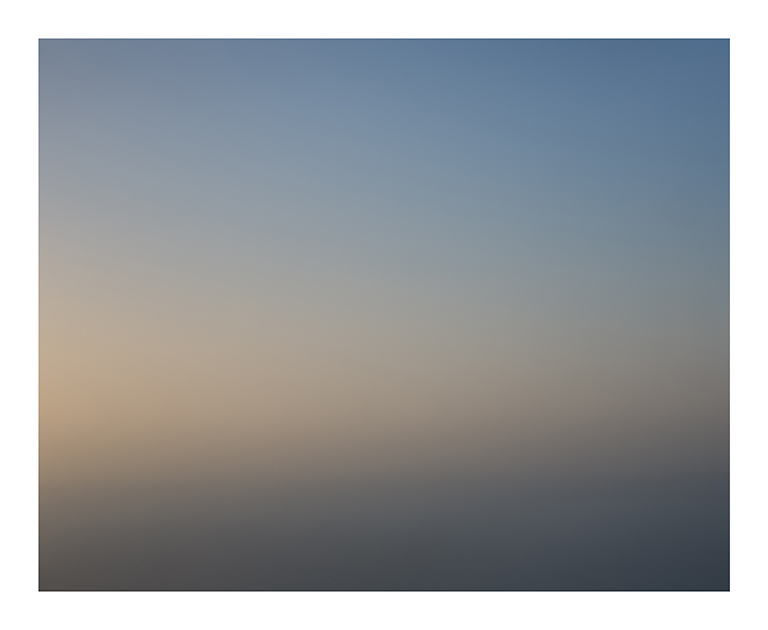 Turner, and to the challenges photography faces in expressively rendering the sea. 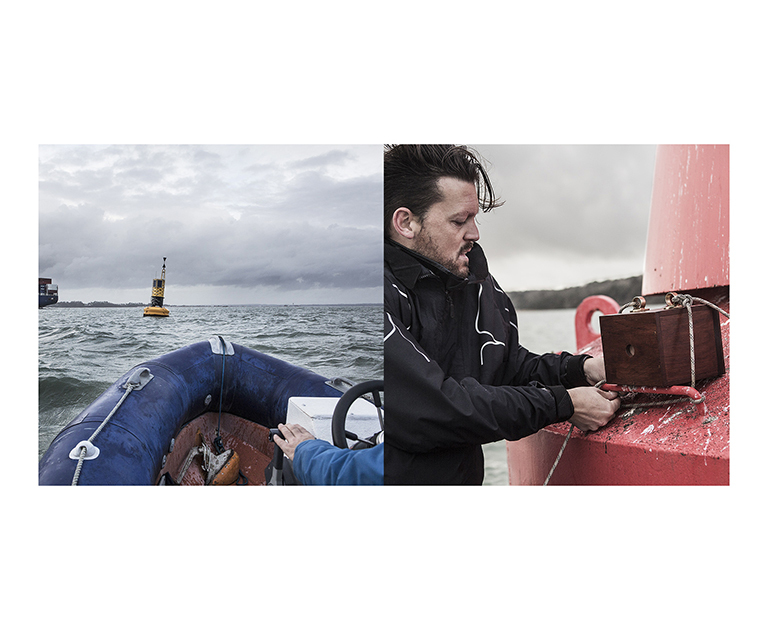 The project involved attaching a pinhole camera to navigation buoys in the Solent, and making exposures ranging from four minutes to an hour. The channel flows around Cowes, the town of my upbringing, and an area in which Turner produced several seascapes. It is famous for the strength of its tides and currents. The project creates an interplay between control and chance. The aspects of control include the selection of the buoy, the choice of the time of day to make the images and the duration of the exposures. There is chance, however, in is the unpredictable movement of the buoy, as dictated by the movement of the sea. The resulting photographs are renderings of the sea and sky, directly produced by the six directions of movement that affect a buoyant object. 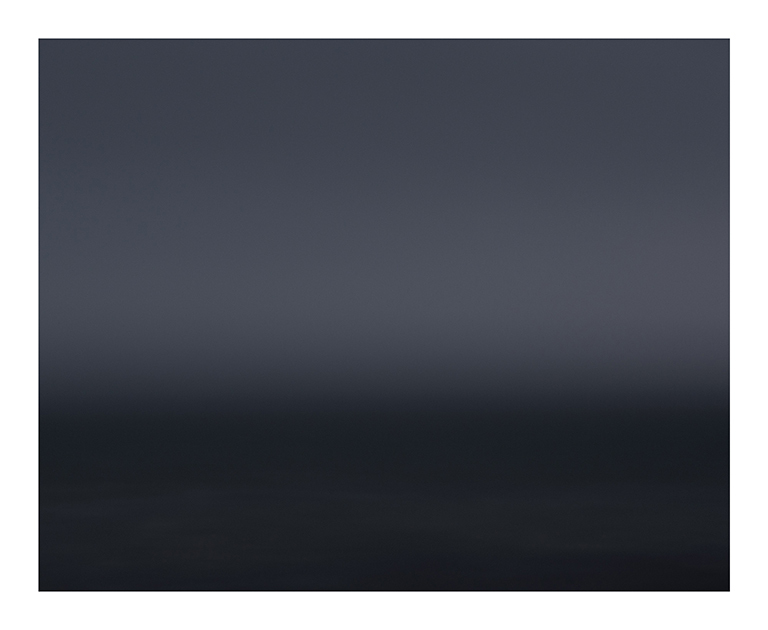 The movement of the sea during the exposures helps to generate a deep ambiguity in the images. The resultant photographs echo the diffuse and indistinct visual effects found in the paintings of such artists as Turner, Caspar David Friederich and Mark Rothko. This is part of the language of the sublime referred to by Immanuel Kant in his Critique of Judgement of 1790. He distinguished between the differences of the Beautiful and the Sublime, noting that beauty “is connected with the form of the object, having boundaries”, while the sublime “is to be found in a formless object, insofar as limitlessness is represented in it”. Born in Mombasa, Kenya in 1977, Richard Boll graduated with a BA Honours degree in Photography from Edinburgh College of Art in 1999, and completed an MA in photography from The University of Brighton in 2016. He is based in Brighton and works full time as an editorial and advertising photographer in London. Awards and commissions include first place in the Audi/Next Level International Award for Contemporary Photography in 2004, first prize in the 2006 National Portrait Gallery Photographic Prize, and a commission from the National Portrait Gallery to photograph Sir David Attenborough in 2007. In 2011 he was a selected winner of the Magenta Foundation’s Flash Forward Exchange. Where did you attend university and what year did you graduate? I graduated from a BA in photography at Edinburgh College of Art in 1999, and then from an MA in photography at The University of Brighton in 2016. What are some standout moments from your time at university? There are times when a project is coming together, when the inevitable doubts and concerns related to the creative process start to subside and the key elements of a project start to fall into place. It’s interesting and rewarding to go through that with a group of people who are going through the same process, with similar challenges. Which photographic genre do you consider your work to fall into? The final project from the MA is titled Six Degrees of Freedom and consists of a set of ten seascapes, with some installation elements. These included a handmade wooden large format pinhole camera that was used to make the images in a display case, a map showing the locations of the navigation buoys used. The last few projects I’ve carried out have been related to landscape, so that would work. What themes do you find yourself exploring? My recent projects look to elements related to the sublime, as well as notions of spiritual navigation, home and loss. What initially inspired you to create a body of work in response to Turner's seascapes? 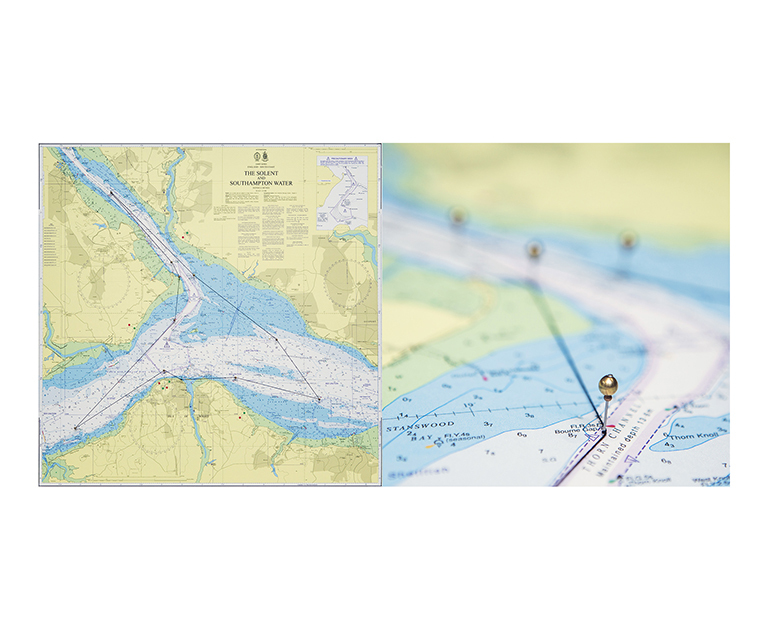 Six Degrees of Freedom brought together a fascination in the seascapes of Turner, as well as questions I was asking about photography's effectiveness in expressively representing the sea. A key element was the specific history of Turner having produced paintings in the Solent channel. The stretch of water flows around the town of my upbringing, which brings a personal element of home to the project, and it happens to be an area of water very well suited for the project, with the number of navigation buoys in the area that are required to guide shipping traffic and small craft around the area. Can you tell us why you chose to express your ideas using a pinhole camera? Was it due to your intention to indicate a contrast between chance and control? I chose to use a pinhole camera due to the long exposures required to make the images. I knew it would be these long (up to an hour) exposures, combined with the movement of the sea that would produce the aesthetic effect that I was looking for. This use of movement from the navigation buoys opened up another element in the work, that of the relationship between control and chance. The elements of control include the choice of buoy, the time of day and the duration of the exposure. The movement of the buoy and sea however were elements of chance, beyond my control. I enjoyed this aspect of the project; of handing over an element of the creative process to chance. Can you explain your series title? Six degrees of freedom are the six directions a buoyant object can move in. If you’re interested… they are surge (forward/backward), heave (up/down), sway (left/right) combined with changes in orientation through rotation about three perpendicular axes, often termed yaw (normal axis), pitch (lateral axis), and roll (longitudinal axis). A great graphic designer called Tim Ball designed a logo for the project that represented this concept. It is these movements, combined with the long exposures required by a pinhole camera that create the diffused aesthetic of the seascapes. Why did you choose the University of Brighton to study for an MA? I was recommended the University of Brighton MA course by several previous graduates and I was impressed by the work of the tutors associated with the course. It is a very good course, and I’d recommend it to anyone who’s considering the MA option. Have you got a favourite book? Photographic or otherwise? A recent favourite book is an extensive retrospective of the painter Agnes Martin (Agnes Martin, Paintings, Writings, Remembrances, Phaidon 2012). I bought it after seeing the fantastic retrospective of her work at the Tate Modern in 2015, and it's clear that a great deal of care and attention has gone into the design and content. Have you exhibited Six Degrees of Freedom? I exhibited the wor as my final MA project at the Universi Brighto graduation show last September, and it's been accepted for The Sussex Open at the Towner Gallery in Eastbourne (22nd July- 1st October 2017). Give one tip to new creative graduates. Although graduates often feel pressure to start producing new work immediately after leaving their course, it's important to remember they've already got a solid body of work, produced to a high level, that needs its own continued promotion and exposure. I say this because it's a weakness of mine, and the balance can be difficult! What are your future creative plans? I've found a balance between commercial work and personal projects that seems to work well, so in some ways, the plan is just to maintain this. I've also been working on a landscape project in Iceland which I plan to chip away at over time, so a return trip this winter would be good.